Mazda packs in a little zoom-zoom for some fun-fun. Smile! 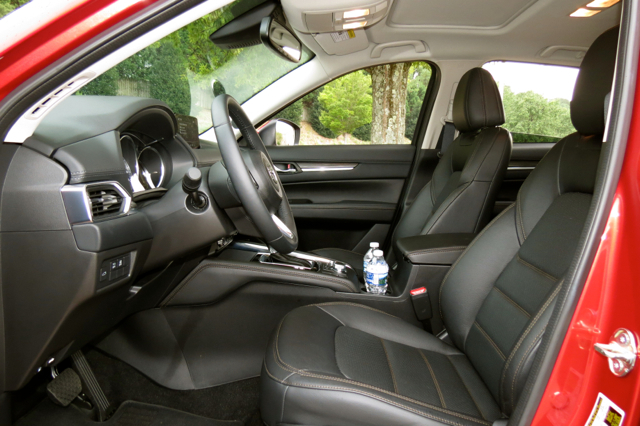 The compact CX-5 is big on style and offered in four grades. Compact SUVs dominate the market with some models jockeying for best-seller status this year. Consumers love these vehicles, which explains why the 2017 CX-5 remains Mazda’s top model. 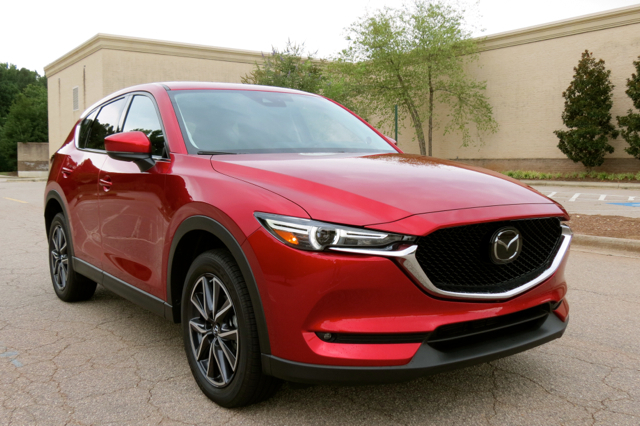 If you’re looking for something that isn’t a Toyota, Ford, Nissan, Chevrolet or Honda, the Mazda CX-5 should be on your list. Just four years removed from its 2013 introduction, the 2017 Mazda CX-5 is all new. Besides a fresh design, this second-generation model has updated cabin materials, new convenience features, and an expanded list of available safety features. The 2017 CX-5 is available in four grades: Sport ($24,045), Touring ($25,915), Grand Select ($28,895), and Grand Touring ($29,395). The Grand Select grade rolled out later in the model year, so it won’t receive more than a mention here. Front-wheel drive is standard; add $1,300 for all-wheel drive. The destination charge is $940. All models have a four-cylinder engine paired solely to a six-speed automatic transmission. It is common for manufacturers to deliver well-equipped, top-trim level models for media inspection. 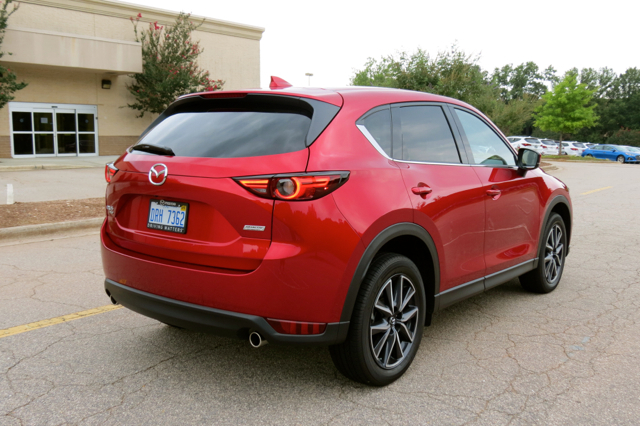 Although there are occasional exceptions, Mazda supplied a CX-5 Grand Touring AWD for Auto Trends testing. The Grand Touring edition starts at $29,395 or $30,695 with all-wheel drive. My test model came in at $34,060, reflecting a $595 charge for the Soul Red reflective paint and an $1,830 premium package offering a two-position driver memory seat, an 8-way power-operated front passenger seat, a heated steering wheel, heated outboard rear seats, windshield wiper de-icer, and an active driving (head up) display. Not everyone is smitten with Mazda’s KODO (soul of motion) design language, found on every vehicle it sells. The look is at once sporty as it is upscale, taking an otherwise plain canvas and transforming it into something entirely vibrant. Now in its second generation, the expression continues, with the front fascia marked by a gaping maw grille, narrow wraparound headlamps, and much sculpting. High wheel arches, a raised beltline and a sweeping roof line mark the profile. From the rear, you’ll find a spoiler, wraparound tail lamps, and on some models there are dual exhaust tips. Standard equipment includes LED headlights, daytime running lights, dual power side mirrors, a rear roof spoiler, and 17-inch alloy wheels. Also available are automatic leveling headlights, automatic on/off lights, LED front fog lights, LED taillights, a power sliding-glass moonroof, and a power rear liftgate. 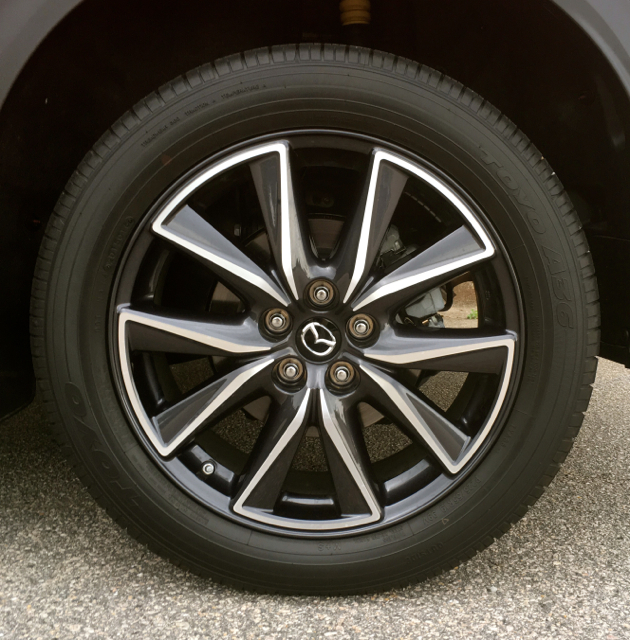 The Grand Touring model comes with 19-inch aluminum alloy wheels. 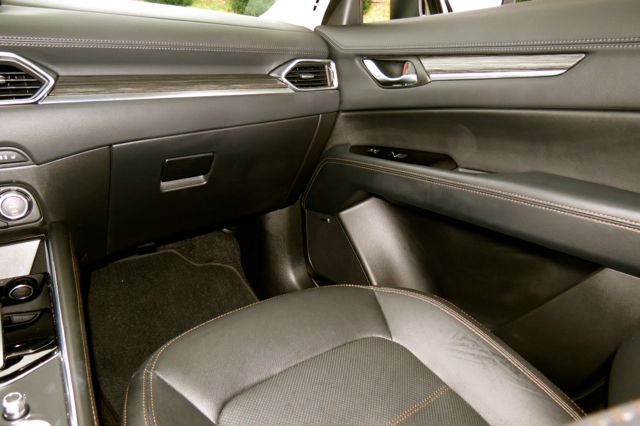 The 2017 CX-5 seats five with bucket seats up front and a 40:20:40 bench seat in the rear. 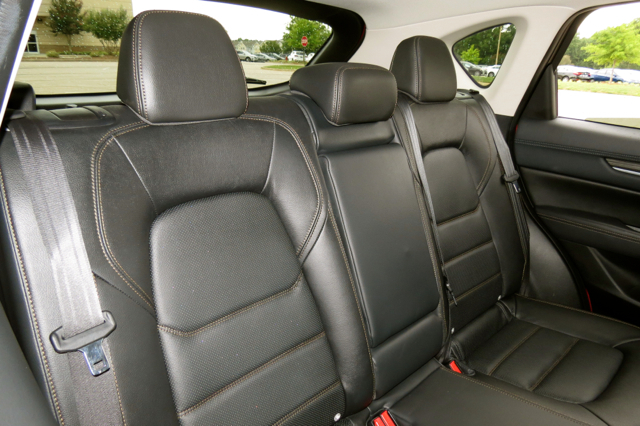 Base sport models have cloth seats; imitation leather dresses Touring models, while the Grand Touring features leather-trimmed seats. 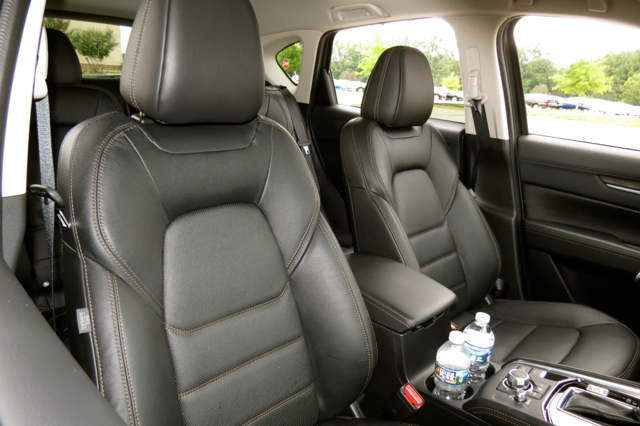 A power driver’s seat and heated front seats appear on the Touring; driver lumbar support comes with the Grand Touring. You’ll find a sporty instrument panel marked by three cowls — one each for the speedometer, odometer, and fuel information. My Grand Touring model had a leather-wrapped steering wheel with mounted auxiliary controls. A tilt and telescopic steering column is standard. On top of the dash and aligned with the center stack is a 7-inch full-color touchscreen display. The center console is neatly organized with knobs and switches, managing the climate control system. At the base of the stack is a deep open storage compartment, large enough to hold a pair of smartphones. Dividing the seats is the transmission shifter and a multi-function control knob for managing the infotainment system. 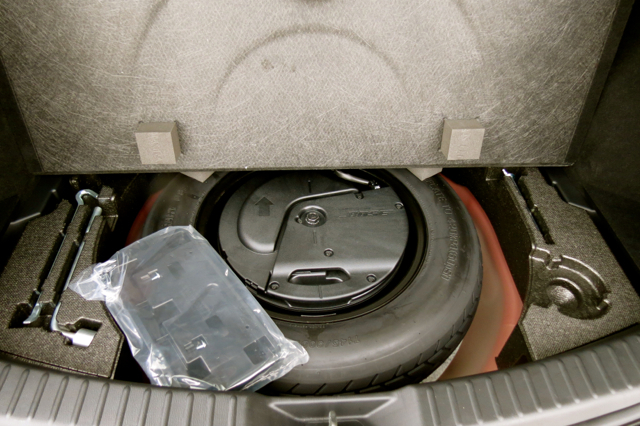 Storage compartments are many and go beyond the glove box to include a deep storage area with a removable tray underneath the center armrest. That’s where you’ll also find a pair of USB ports and an auxiliary input. 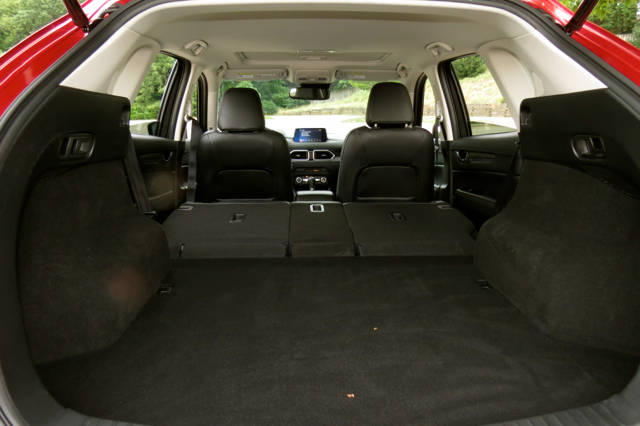 All four doors have storage compartments and drink holders. Four cup holders — two up front and two in the rear round out the drink compartments. All models have keyless entry and push-button start, full power accessories, air conditioning, cruise control, and an overhead console with sunglass holder. Available equipment includes dual-zone climate control, illuminated visor vanity mirrors, a leather-wrapped shift knob, rear air conditioning vents, and a rear seat center armrest. The Touring grade offers a Preferred Equipment Package ($780), bundling such features as automatic headlights, HomeLink, the Bose audio system, navigation, power moonroof, and a power liftgate. 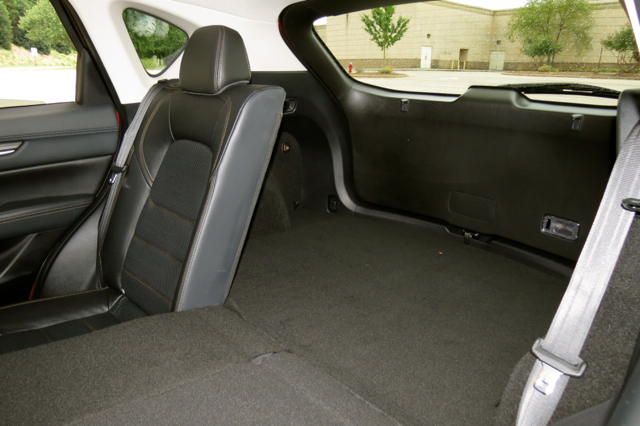 You’ll also find an available Premium Package ($1,830) on the Grand Touring trim, with those features mentioned above. 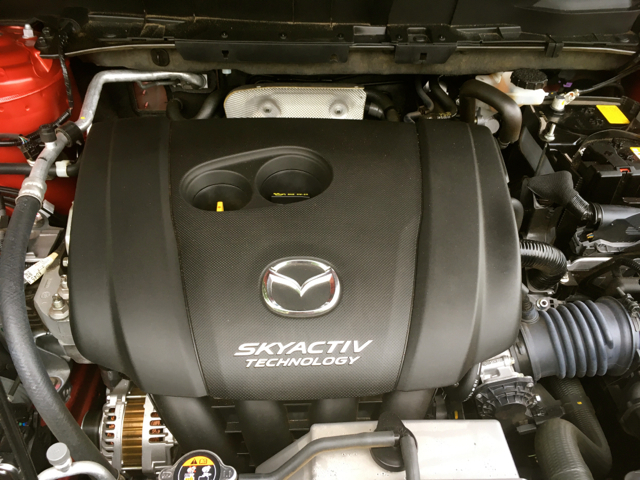 It isn’t uncommon for models in this segment to offer one engine choice, namely a four cylinder. That’s how Honda, Jeep, Nissan, and Toyota do it. 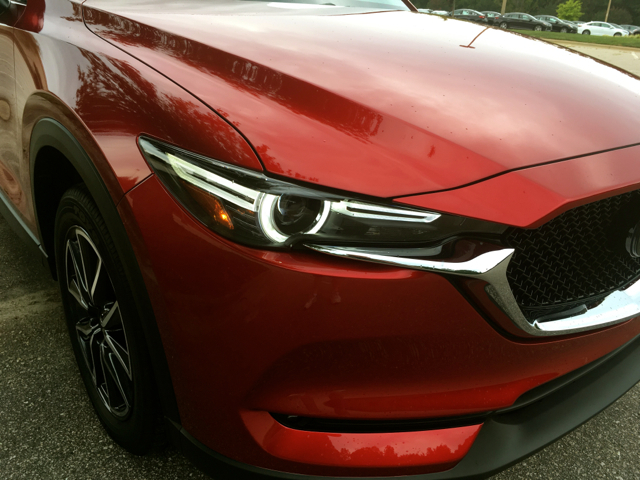 The 2017 CX-5 comes with a 2.5-liter engine making 187 horsepower and 185 pound-feet of torque. It is exclusively paired to a six-speed automatic transmission with manual mode. Paddle shifters are not offered. I found the CX-5 sufficient for the task, although it isn’t an outstanding performer. Flick to sport mode and the engine kicks it up a notch and the transmission shift points offer longer intervals. Along with surprisingly engaging handling, this is where the CX-5 offers a bit of zoom-zoom making for a measure of fun-fun. If you’re looking for more power, you’ll have to cast your eyes elsewhere. For example, the Ford Escape offers three engine choices, including a 2.0-liter turbocharged engine making 245 horsepower and 275 pound-feet of torque. On the other hand, you have the Hyundai Tucson offering a 2.0-liter engine, but it is skewed toward fuel economy, delivering just 164 horsepower. If you have diesel on your mind, the 2018 Chevrolet Equinox is the sole model with this engine choice. Mazda nailed the Insurance Institute for Highway Safety’s Top Safety Pick+ rating for the 2017 CX-5. This is the highest rating offered by the institute, representing a consortium of insurance companies and associations. 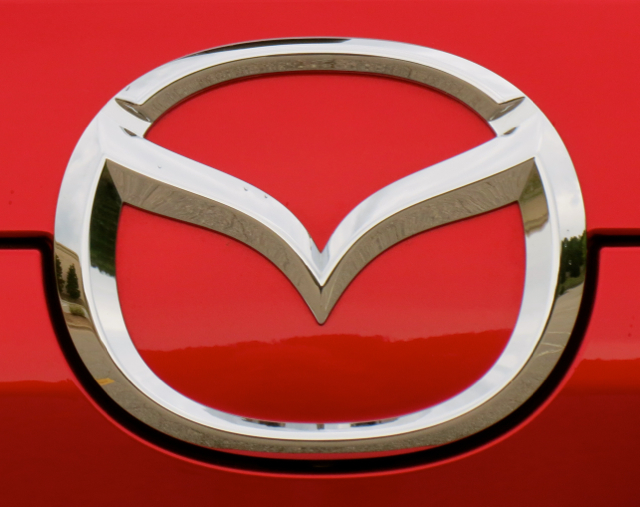 The National Highway Traffic Safety Administration (NHTSA) gave the Mazda a four-star rating out of a possible five stars. The only demerit was a four-star rating for rollover. 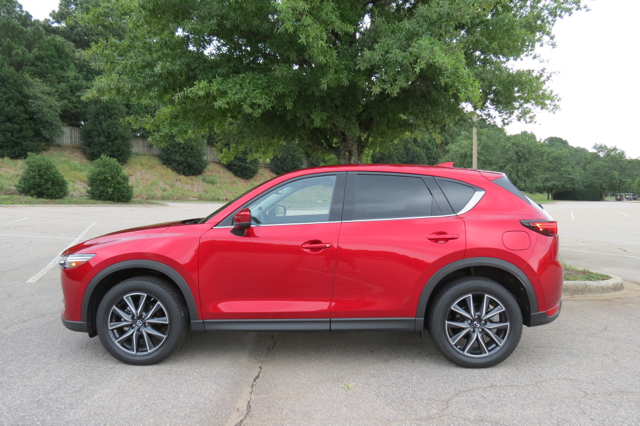 The 2017 CX-5 comes with a rearview monitor, brake assist support, and expected support such as stability and traction control, and a tire pressure monitoring system. Not available on the base model, but offered as an option on the Touring model is an i-Activsense Package ($625) composed of high beam control, lane departure warning with lane keep assist, radar cruise control, automatic headlights, and other features. A four-speaker audio system is in the Sport model. Touring models have a six-speaker system, while the Grand Touring has a Bose 10-speaker audio system. Bluetooth connectivity, HD Radio, and a rearview camera come standard. The Mazda Connect infotainment system comes with each model and includes Aha internet radio integration, voice command, Pandora, SMS text messaging, and Stitcher. So, there you have it. 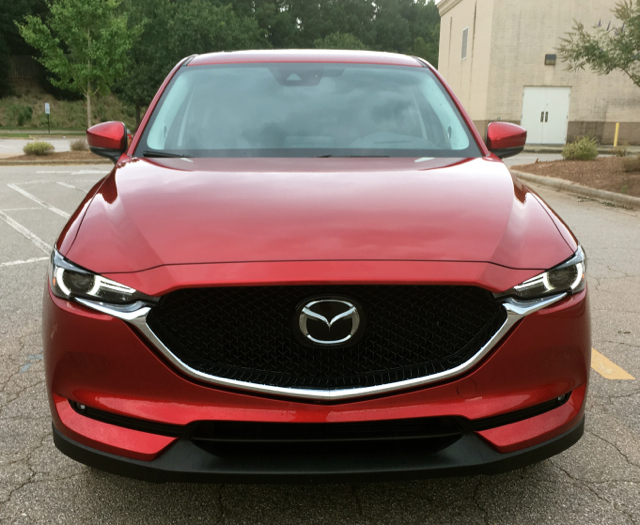 My impressions of the 2017 Mazda CX-5. All in all, the CX-5 brings flair to the segment, although a number of competing models can claim the same. That’s great for consumers as there isn’t a dull looker among them. 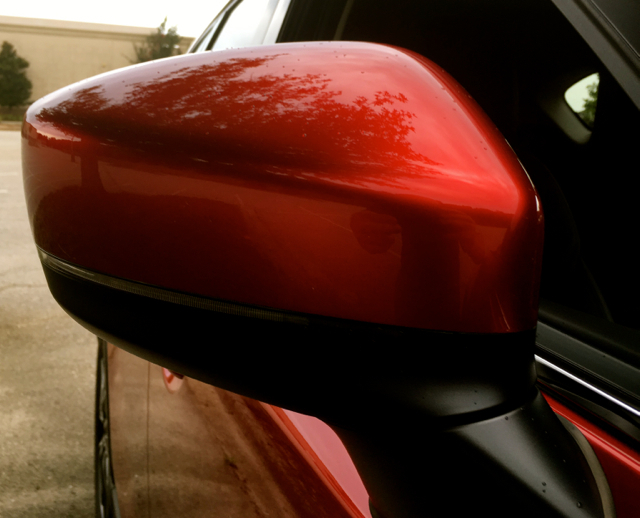 If you shop the CX-5, the Touring edition is a great place to start. Most customers won’t need all-wheel drive, therefor stick with the front-wheel drive. With the Preferred Equipment Package, your price reaches $28,000, and that’s before discounting and your deft negotiating skills kick in.